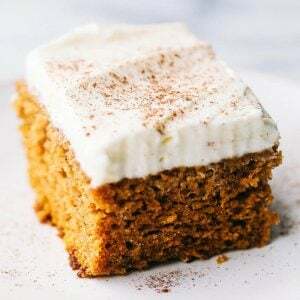 This Pumpkin Cake is the most amazing pumpkin cake you will ever make! 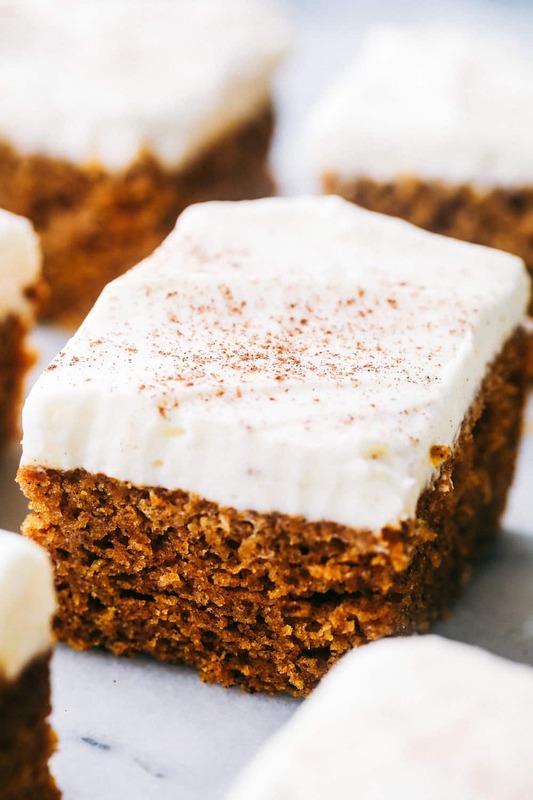 Perfectly spiced and moist and topped with the most epic cream cheese whipping cream frosting! 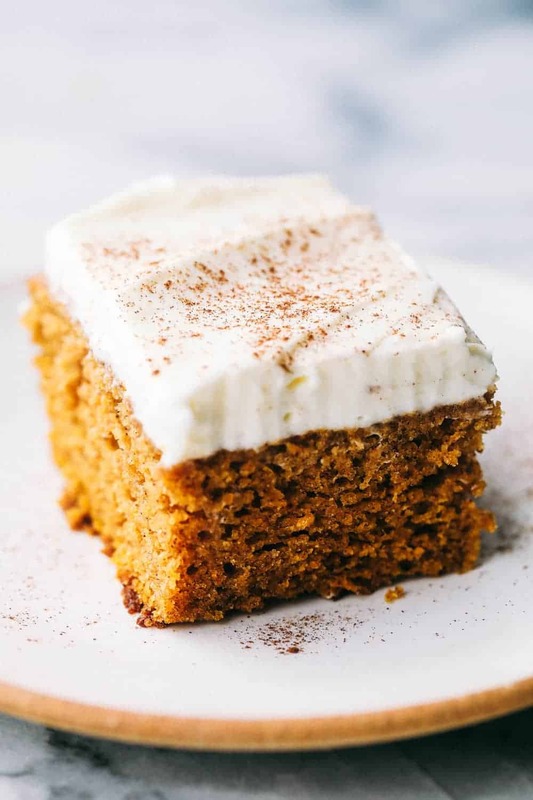 For even more delicious pumpkin cakes, be sure to try: Pumpkin Cake with Cream Cheese Frosting, Pumpkin Pudding Cake, or Pumpkin Pie Icebox Cake! My house has been filled this last week with the aroma of pumpkin spice. Bring on #allthepumpkin. I seriously can’t get enough pumpkin this time of year. 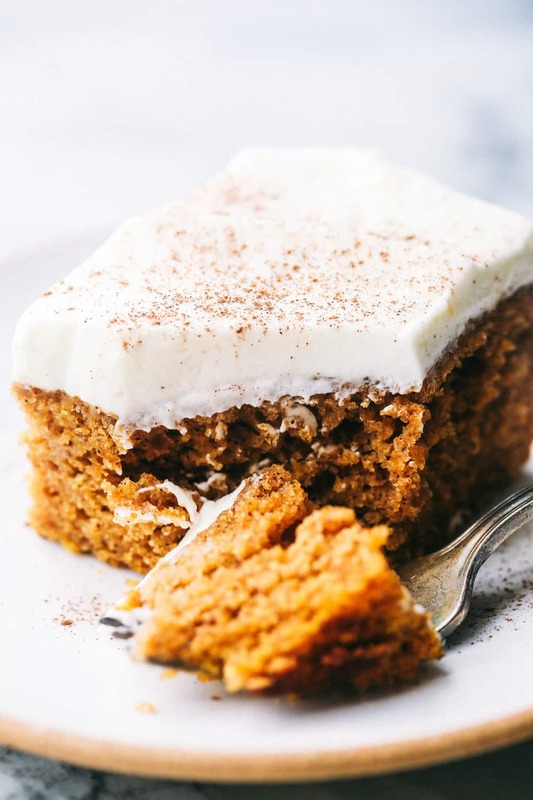 But today I am here to bring you the absolute BEST pumpkin cake. I have had a lot of pumpkin cakes in my life, but this one was hands down the best. It is the so incredibly moist and tender with the perfect amount of spice. You have GOT to make it. PLUS the cream cheese whipping cream frosting is EPIC!! If you have not tried whipping cream with cream cheese it is seriously to die for. It helps to stabilize the whip cream, and it is seriously the best, creamiest, fluffiest delicious frosting on top of the cake. You are going to love it. 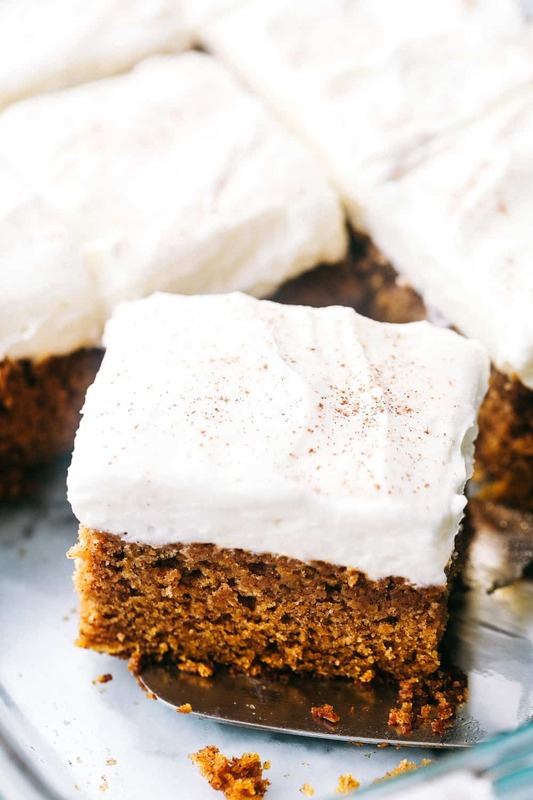 How do I make an easy pumpkin cake recipe? Preheat your oven to 350 degrees. Grease a 9×13 inch pan and set aside. In a large mixing bowl add eggs, sugar, vegetable oil, pumpkin puree and beat until smooth. In another mixing bowl sift together the flour, baking powder, salt, baking soda, and cinnamon. Add to the wet ingredients and combine thoroughly. Pour into your prepared pan and bake for 25-30 minutes or until a toothpick comes out clean when inserted into the center. Remove and allow to cool. Once the cake is cool, make the cream cheese whipping cream frosting. Add softened cream cheese, whipping cream, and powdered sugar to a large bowl. Beat until stiff peaks form and it is set. Spread it over the cooled cake. Store in the refrigerator. 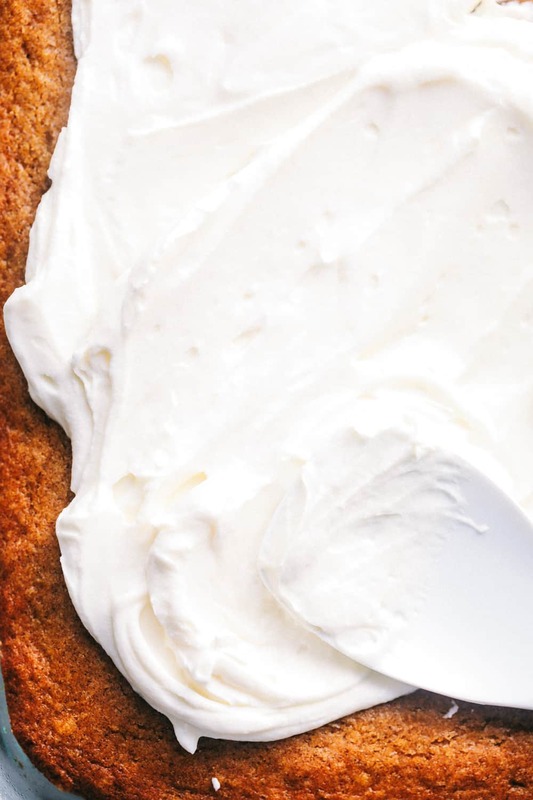 How do you make cream cheese frosting with whipping cream? This is my FAVORITE way to make frosting. It is smooth, creamy, and spreads perfectly, not to mention it tastes amazing! Add softened cream cheese, whipping cream, and powdered sugar to a large bowl. Beat until stiff peaks form and it is set. Spread it over the cooled cake. Store in the refrigerator. Looking for more amazing pumpkin recipes? Look no further! Preheat your oven to 350 degrees. Grease a 9x13 inch pan and set aside. In a large mixing bowl add eggs, sugar, vegetable oil, pumpkin puree and beat until smooth. What exactly is Cream Cheese Whipping Cream? What amount of this mystery stuff. 1-1/2 Cup of whipping cream (unwhipped) and lastly 1 cup powder sugar. Must be obvious to some but is a stumper to me. The whipping cream cheese is what you are going to be making with the ingredients listed underneath it. It is just in a bullet form. Hope that helps! Regarding the pumpkin puree; just to make sure is it pumpkin puree or solid packed pumpkin. Usually the pumpkin puree is in a larger can & the solid packed pumpkin is in the 15 ounce can. Do you only use 1 ounce of cream cheese, or 1 package? Once you frost this cake how long can you store in the refrigerator? I made the cake ahead of time and not sure if i should make the frosting the day we are going to eat the cake?